What’s next for iPhone? 2017 will be Apple’s 10th anniversary iPhone year and the latest intel shows it could be one of the biggest updates to the device in a long time. 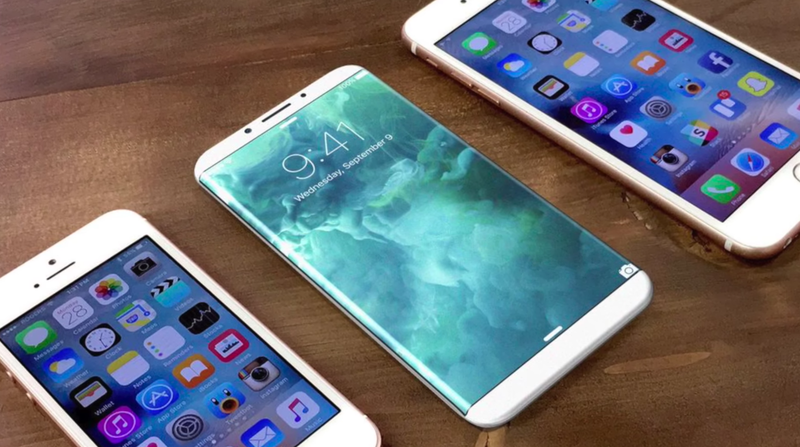 Bigger, better, and curved displays, an all-glass design, wireless charging, and a new embedded home button are just some of the features Apple is reportedly considering for the iPhone 8. Head below for our full roundup of everything we currently know about Apple’s next flagship. That 5.8-inch model, according to one report, will actually have a 5.2-inch panel of usable touchscreen space with the remainder of the display curving around the edges of the device. And it’s not just that report that points to evidence Apple is working on a new curved display for some upcoming iPhone models. The Wall Street Journal recently confirmed Apple is prototyping a hi-res curved-screen model as a possible top-tier iPhone 8, and a separate report citing supply chain sources claimed Apple was partnering with LG Display on a foldable OLED for upcoming iPhones. While the 5.8-inch iPhone 8 is said to be the first to switch to an OLED display, one report said the 4.7-inch and 5.5-inch updates would remain with LCDs. Though there are a couple additional reports that a 5-inch iPhone model is also being planned for next year, it’s unclear where that would fit in the lineup if accurate, especially if a 4.7-inch model does indeed stick around. Lastly, the company is said to not be planning an update to its current iPhone SE model introduced last March, the last of the 4-inch iPhone models on the market. A separate report said Apple is planning a red chassis as a new color option for an upcoming iPhone, and there are still rumors floating around that the company is working on a white color option for iPhone 7 that could presumably make its way to the “iPhone 8” next year too. If all the supply chain chatter is accurate, wireless charging functionality could be one of the highlight new features for the iPhone 8. A recent report from KGI said Apple was planning to offer wireless charging on three new iPhone models (4.7-inch, 5.5-inch and the new 5.8-inch), though the supply chain analysts also suggested the wireless charger would not be bundled with the device and instead sold as a separate accessory. Backing up the report, separate supply chain intel back in October claimed Apple manufacturing partner Foxconn was producing and testing wireless charging modules for iPhone 8. Inductive wireless charging has been available via accessories and on other smartphones for quite a while, but Apple has made it known publicly that it doesn’t like the tech. The company’s head of marketing Phil Schiller noted back in 2012 that “wireless charging systems still have to be plugged into the wall, so it’s not clear how much convenience they add.” That’s what makes Apple’s reported connection with Energous, a company that has developed a truly wireless charging solution called WattUp, all that more interesting. The technology can charge devices from up to 15ft away using a single transmitter and a receiver embedded into your device. That means no charging mats or additional accessories to plug-in like current solutions. A recent report noted that Apple supplier Dialog has partnered with Energous. Before that discovery, a separate story detailed what appeared to be evidence between Apple and Energous, although the company later responded, it didn’t deny a partnership with Apple. It has been rumored for several years now that Apple is experimenting with a Home button embedded right into the iPhone’s display and Apple even has patents for such a concept. That would allow it to reduce or perhaps remove the bezel on the front and increase screen real-estate without increasing the size of the device. One patent showed Apple is even exploring methods of allowing fingerprint recognition almost anywhere on the screen. Add in the curved display that Apple is reportedly considering for at least some of the new iPhones and you can imagine what could be quite a stunning update for the front side of the iPhone 8 with near edge-to-edge glass. While the reports on these features are few and far between at this point, there are at least some clues that augmented reality features are in the cards for future iPhones, perhaps even starting with the iPhone 8. In January, 2016 a report said Apple was building a secret research team to develop virtual and augmented reality tech including reportedly prototyping VR headsets. A separate report back in November claimed Apple is working on AR features that will debut first in a future iPhone’s camera app and tap into technology the company picked up through its acquisition of Metaio and others. That includes object and facial recognition camera features, according to the report, with plans for an SDK for app developers down the road. A separate report from Bloomberg said Apple is exploring digital glasses that could be released as early as 2018.
iPhone 8 concept images via ConceptsiPhone.